No time to make supper tonight? Before you settle for a sodium-laden, processed frozen meal, see how easy it is to use fresh ingredients to create your own dynamic and healthy dinner. These seven chicken recipes are family favourites, and take almost no time to prepare. Remember to use organic free-range chicken where possible. The best part? Each of these recipes takes less than 30 minutes! If you are using fresh chicken, broil for about 6 minutes on each side, cool and shred. Preheat oven to 400 degrees. In a bowl, combine chicken, olive oil, cheddar cheese, and salsa. Divide the mixture between 12 tortillas. Fold and seal by moistening tortilla edges with water. Place the tortillas on a backing sheet. Bake for six minutes. Serve with fresh salad, Spanish rice, or re-fried beans. Top with sour cream, guacamole (yum), or toppings of your choice. Makes 12 servings. 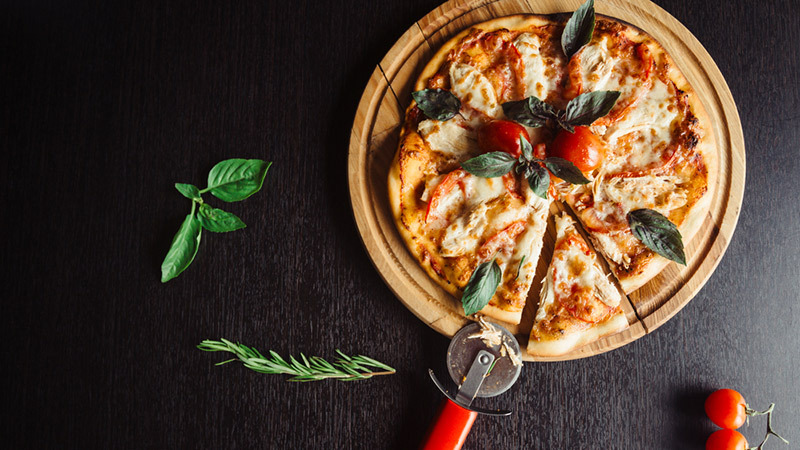 A family gathering favorite, you kids will have fun helping you create this pizza. 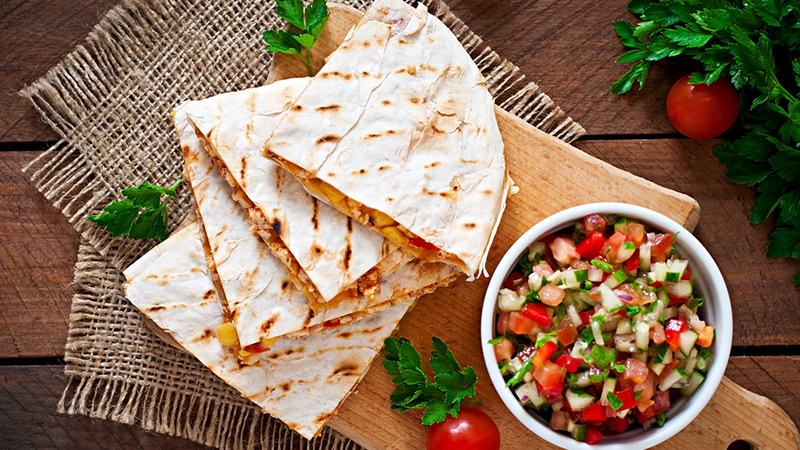 Combine all ingredients into a bowl, leaving flatbread aside. Heat the grill to low heat. Place the flatbread on the grill. Spread the mixture over flatbread. When the cheese has melted, it is ready to enjoy (doesn’t take long to heat). Cut into slices and serve. Makes six servings. You can use the mayonnaise of your choice for this recipe. Preheat oven to 375 degrees. Mix mayo, garlic, and cheese. 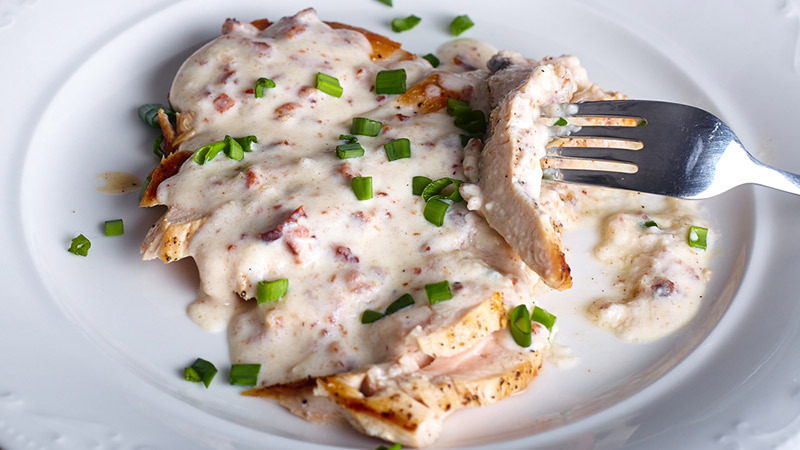 Coat chicken breast with mixture and place in a non-stick baking dish. Bake for 45 to 50 minutes, depending on thickness of chicken breasts. Serve with fresh steamed broccoli and chunky cooked carrots. Makes five servings. This is a favorite brunch or lunchtime go-to. Use two cups frozen diced chicken (or leftover chicken) and add a dollop of your favorite low-fat yogurt. 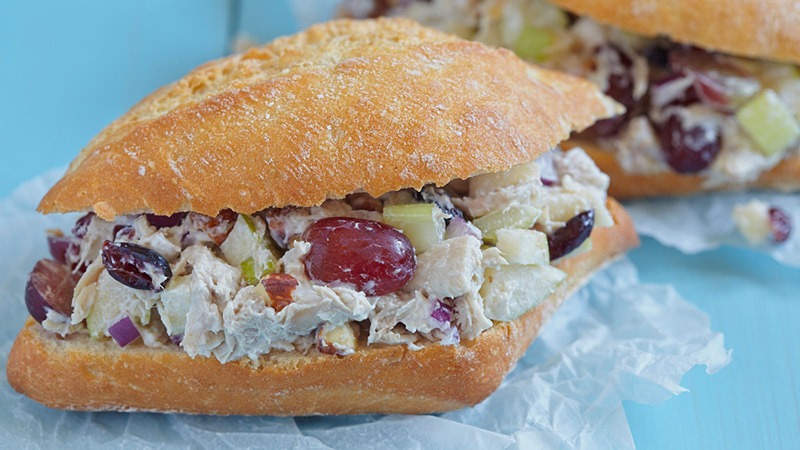 Add diced celery (to taste), ¼ cup poppy seed salad dressing, ¼ cup red grapes, and ½ cup roasted pecans. Salt/pepper to taste. To create a tropical version, add chopped pineapple vs. grapes, and macadamia nuts vs. pecans. Mix in ¼ cup fresh shredded coconut for a summertime favorite. Serve chilled with your favorite pita chips or melba toast. This makes a light evening meal with a glass of red wine. This is a low-cal version of the higher-calorie Caesar. Use silken tofu for a creamy salad vs. mayo. In a blender, combine tofu, mustard, olive oil, vinegar, garlic, Worcestershire sauce and lemon juice. Blend until creamy. 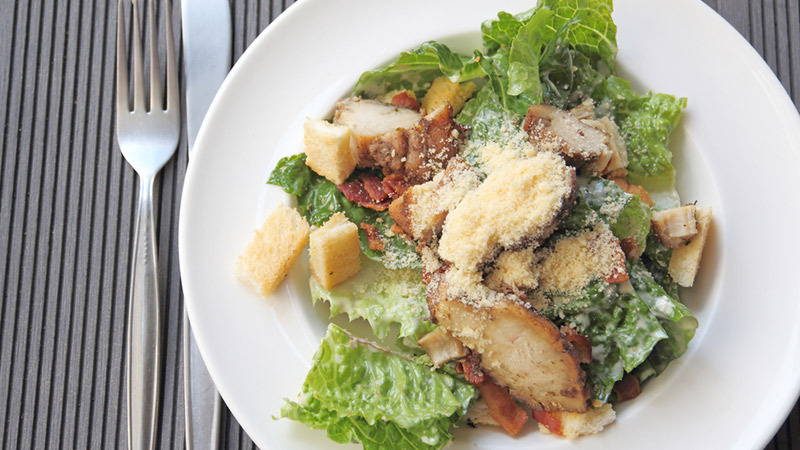 In a large bowl, toss croutons, lettuce, Parmesan and dressing. Divvy salad into four portions, adding chicken on top of salad. Serve with fresh tangelo wedges, if desired. Serves four. 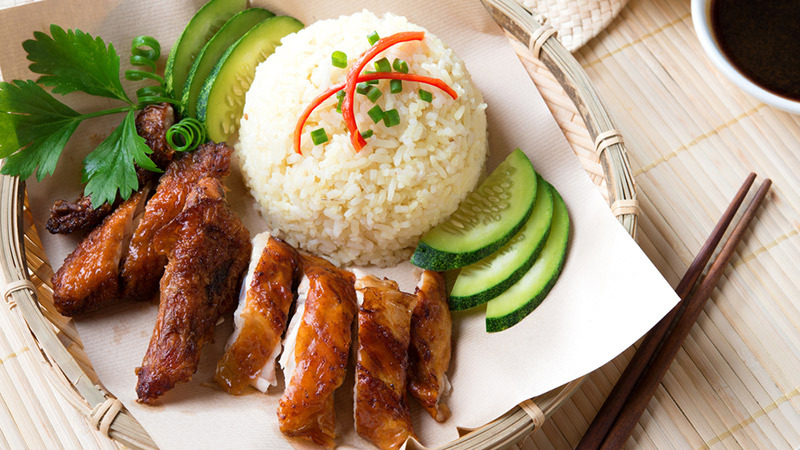 Purchase organic all the way for a healthy version of a classic chicken dish. Serve with green beans and cooked carrots for a beautiful meal. Preheat oven to 375 degrees. 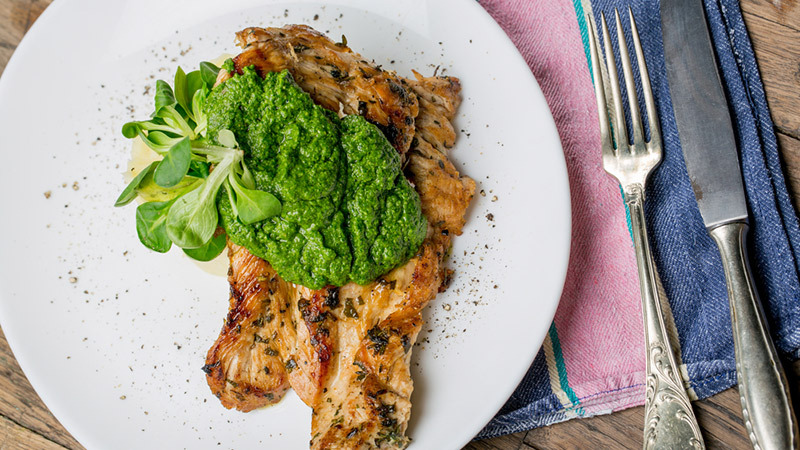 Coat both sides of chicken breasts with pesto sauce. Roll in crushed corn cereal. Place on a non-stick baking sheet and bake for 20 minutes. A low-cal favorite, use brown rice for a healthier version. In a large skillet, add cooked brown rice, peas, chicken strips, olive oil, and soy sauce. Heat for 3 minutes, stirring until evenly heated. Remove from heat, serve with toasted almonds as a garnish. Makes three servings.